The Five Drawer Chest is an excellent addition to your sleeping space. This storage piece is tall and serves as an alternative to a dresser in small spaces or as an additional stowing space in a larger room. This chest has sleek lines and shiny rectangular metal drawer pulls, contrasting nicely with the dark antique brown finish of the wood. A bead moulding border along the top, bottom, and around the drawers adds depth, while the slightly flared legs bring a touch of femininity to the space. Use the drawers to store large items such as clothes or blankets, and place a lamp or decorative item on top. 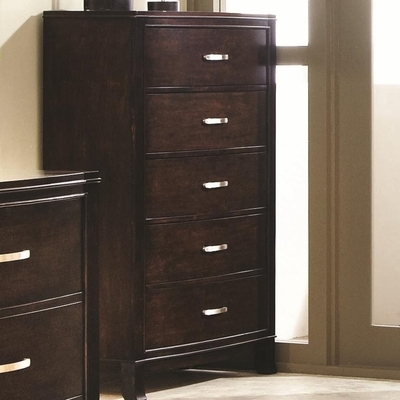 For a welcoming and functional bedroom, look no further than the Five Drawer Chest.